One of several springtime species of Psathyrella, Psathyrella pseudovernalis appears in hardwood forests, often at about the same time as yellow morels. 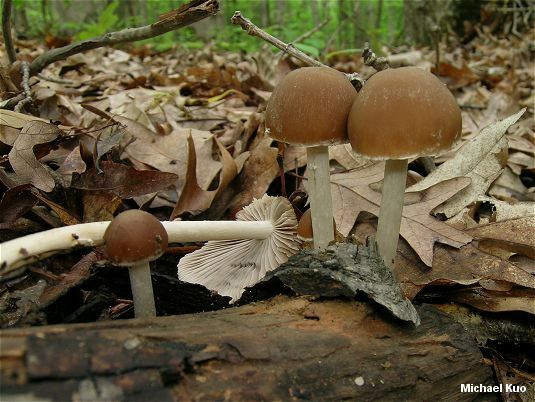 It is a fragile, brown mushroom with little wisps of veil material along the cap margin, a dark brown spore print, and a snap-able white stem. 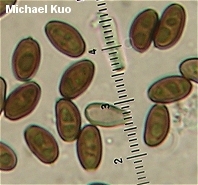 Microscopic features must be consulted to separate Psathyrella pseudovernalis from other species of Psathyrella; it features fusoid-ventricose (rather than utriform) hymenial cystidia, and gill edges bearing few cheilocystidia but many sphaeropedunculate elements. 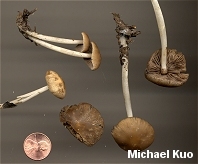 The name "Psathyrella vernalis," as it is applied by Moser (1955, 1983) and by Hansen & Knudsen (1992), probably represents the same mushroom. Smith separated his North American species, Psathyrella pseudovernalis, for a single, very dubious reason: "P. vernalis, a European species, apparently has paler spores." However, use of the name Psathyrella vernalis is complicated by the fact that it is illegitimate (it represents a homonym for a different species named by Velenovsky) and by the fact that Kits van Waveren (1985) reduced the species to a mere "form" of Psathyrella spadiceogrisea (along with Orton  and Hansen & Knudsen  I disagree on this point). Ecology: Saprobic; growing scattered to gregariously or in small clusters in hardwood forests, often near woody debris; spring; apparently widely distributed in North America. Cap: 2-4.5 cm; convex, broadly conical, broadly bell-shaped, or nearly flat at maturity; bald; the margin finely lined; medium yellow-brown, fading markedly as it dries out to brownish buff; when young with wisps of veil tissue, especially along the margin. 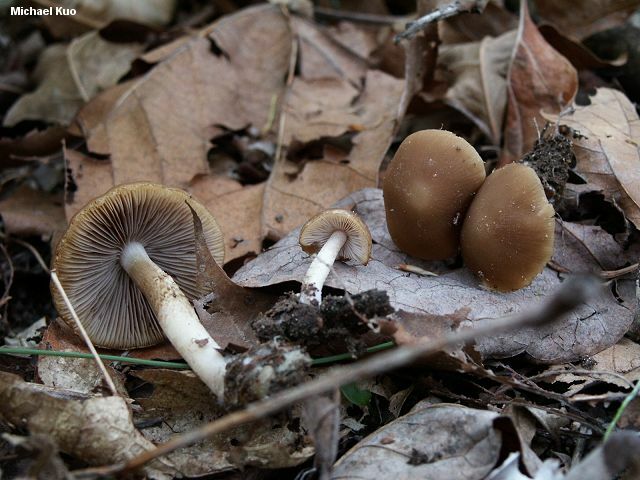 Gills: Attached to the stem; close or nearly distant; whitish to pale brownish at first, becoming dark brown. Stem: 3-10 cm long; up to 5 mm thick; equal; fragile; white but often discoloring dirty yellowish to brownish in the middle with maturity; bald or very finely silky; without a ring. Chemical Reactions: KOH on cap surface at first negative but turning purplish after 60-90 seconds. 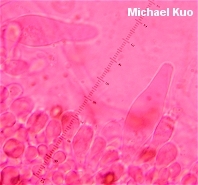 Microscopic Features: Spores 7.5-9.5 x 4-5.5 µ; ellipsoid; with a pore; smooth; dark brown in KOH. 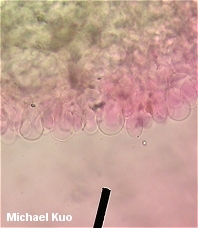 Pleurocystidia fusoid-ventricose; thin-walled; to about 70 x 15 µ. Cheilocystidia subfusiform; infrequent; thin-walled. Sphaeropedunculate elements on gill edge abundant; subglobose, without apical necks. Pileipellis hymeniform/cellular. REFERENCES: Smith, 1972. (P. vernalis: Moser, 1983; Hansen & Knudsen, 1992.) Herb. Kuo 04220301, 04240303, 05050704.